You love checking out celebrity totes in Cosmo.ph's popular What's In My Bag? section. Now, it's time you pick out your own statement-making bag for each occasion: weekend escapades, girls' night out, school, or shopping trips! The bag you stuff with more than a night’s worth of clothes, accessories, and toiletries has to be very big and roomy. Check out fun and colorful weekender selections from USA-made LeSportsac as well as more classy selections from Zero Halliburton. Of course, you can't be lugging around all your things when you visit the sights in your destination, so we included some adorable mini travel bags (check out baglettes from Healthy Back Bag that won't put extra weight on your already stressed spine while you tour all day) and kikay kits. They’re big enough to house your essentials safely and stylishly! To match your to-die-for clubbing get-up, we picked out small bags that leave enough room for your phone, touch-up tools, and moolah for drinks. Aside from pink leopard prints (among others designs), there are metallic and bright-colored options for the fun-loving woman. When you hit the malls, you need a practical bag that can keep all your daily essentials but is light enough to be strapped to your shoulder for long hours while you scour the stores. 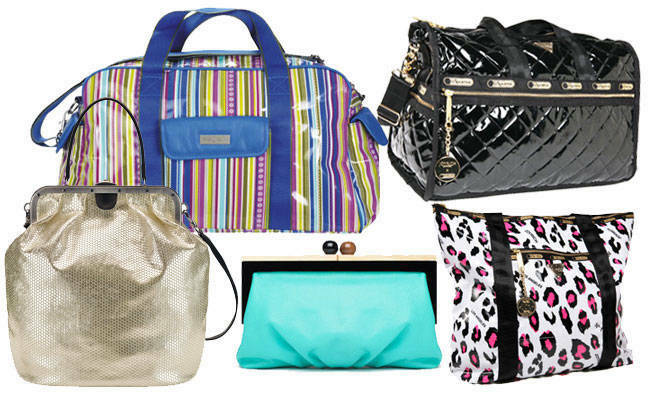 Check out options from LeSportsac, Furla, Michael Kors, Kate Spade, and Marc Jacobs that are portable without sacrificing important style qualities. When you'll be transferring from one building to another, from one meeting to another, you need a big yet easy-to-carry tote for all your essentials. Check out picks from US brand Hadaki, LeSportsac, Marc Jacobs, and Zero Halliburton. We also included fun laptop cases and backpacks that have the ability to brighten just about anybody’s day! Browse through the bags in our gallery and keep that in mind when you hit the stores this weekend! Happy shopping!